A tasty cake with fruity, fresh strawberries would be just the thing on these warm summer days,” we thought to ourselves. 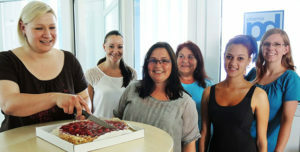 As a result, we advertised our company under the motto “7 Fruits and a Male” in the strawberry cake reporter campaign of the local radio station Radio Eins. Promptly the RadioEINS reporter set off for Lichtenfels to get to know the 7 little fruits and one male. He sniffed curiously into the day-to-day work of pharmadocs and learned a lot about our activities in the field of drug approvals. With a freshly baked strawberry cake in his luggage, the radio reporter gave the entire pharmadocs team a delicious treat.